Massachusetts Safe Routes to School, the statewide program which teaches children how to walk and bike to school safely, honored 14 communities with awards at the State House this morning. Breakstone, White & Gluck and our Project KidSafe campaign were also recognized for donating children’s bicycle helmets to the program. 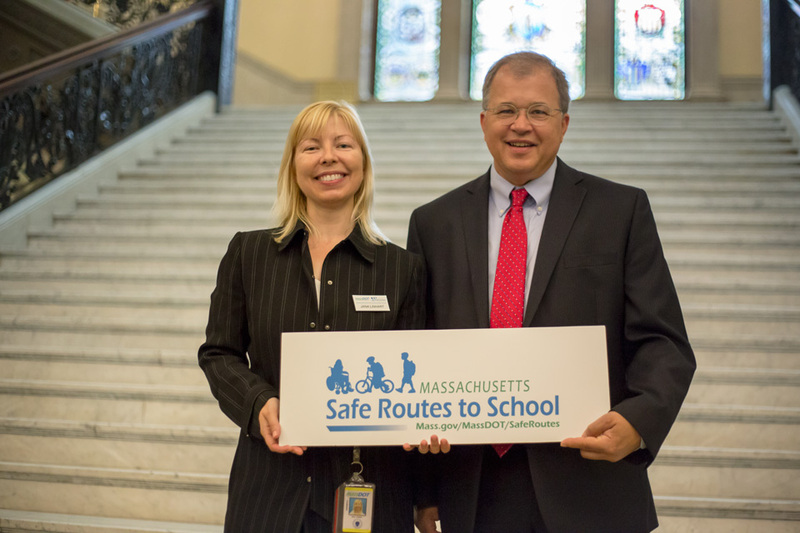 Attorney David White of Breakstone, White & Gluck attended the 2016 Massachusetts Safe Routes to School Awards and is shown here with Jana Linhart, a school outreach coordinator with Massachusetts Safe Routes. Lt. Governor Karyn Polito was the keynote speaker at the 2016 Safe Routes to School Awards ceremony, which was held in the Grand Staircase Hall. Other speakers included: Scott Bosworth, the chief strategy officer for the Massachusetts Department of Transportation (MassDOT); Michael Cahill, mayor of the City of Beverly and Diane Hanson, program director for Massachusetts Safe Routes to School. 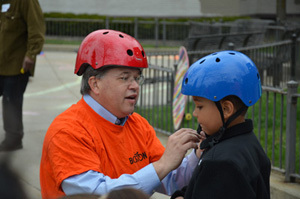 Breakstone, White & Gluck has partnered with Massachusetts Safe Routes to School (Massachusetts Safe Routes) for the past two years, by donating bicycle helmets to children who need one and participate in the organization’s bicycle safety programs. In 2016, we donated 400 new bicycle helmets for children. “We have already given away a third of the helmets this year. We are so thankful for their support,” said Nikki Tishler, of Massachusetts Department of Transportation (MassDOT), while addressing the event. MassDOT manages the Safe Routes to School program. Breakstone, White & Gluck has made these bicycle helmet donations as part of our Project KidSafe campaign, which we launched in 2013 with a goal of keeping children and families safe. 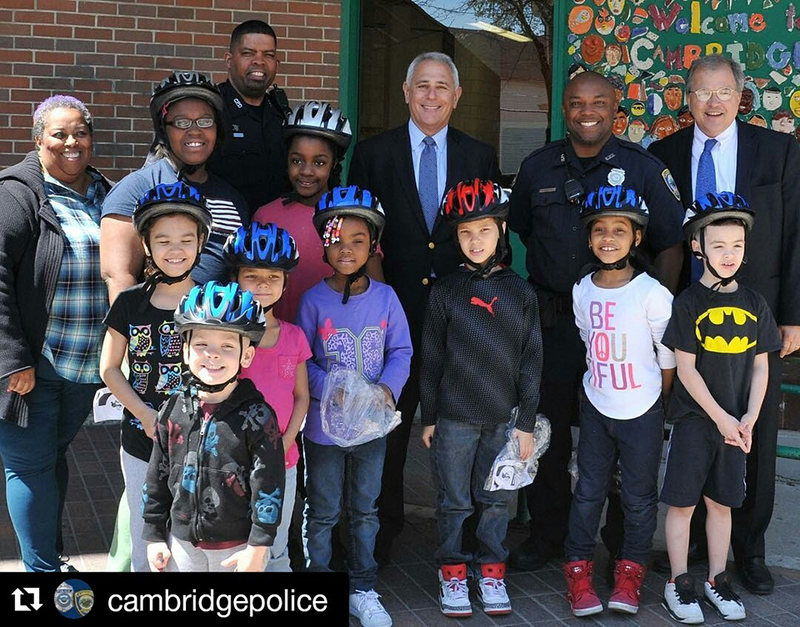 We have since donated over 10,000 bicycle helmets to children across Massachusetts, with help from organizations such as Massachusetts Safe Routes, Boston Bikes’ Roll It Forward, Bikes Not Bombs, CYCLE Kids and many local bicycle committees, schools and police departments. Our law firm wants to help promote bicycle safety in Massachusetts. Wearing a bicycle helmet is the most effective way for cyclists to protect themselves from a head injury and is especially important for children in case of a bicycle accident or fall. Still, many children and families do not wear one and we want to help make a difference. Massachusetts Safe Routes has been making a difference and protecting children for 10 years. It was one of the first Safe Routes programs in the country and today, its programming reaches over 333,000 students. It works with 51 percent of schools in Massachusetts, has 740 partner schools and is active in 199 communities. In addition to educating students, it works with school resource police officers and organizes fun events such as bike rodeos. It has also started developing programs to help children walk and bike to school safely in the winter. If you are a parent, you may be familiar with Safe Routes programming. If not, visit the website for a list of important safety tips: http://www.commute.com/safe-routes-to-school/resources.